Dublin becomes the first European capital to endorse BDS for Palestinian rights and to call for dropping Hewlett Packard (HP) companies for their complicity in Israeli apartheid. Durham, North Carolina becomes the first US city to ban its police department from participating in international exchanges with the Israeli military or police. In a unanimous vote, Durham’s City Council banned police exchanges with any international agencies that would give Durham officers “military-style training” contrary to the city's vision for community safety. A wave of major cities across the Spanish state express strong support for Palestinian rights. They all denounce President Donald Trump's decision to move the US embassy to Jerusalem and slam Israel's latest massacre of Palestinians in Gaza. Many call for an arms embargo on Israel and urge governments to ensure its implementation. Shakira cancels her July concert in Tel Aviv, following a campaign involving Lebanese, Colombian, US, Palestinian, Israeli and other boycott activists. Grammy-nominated star Natalia Oreiro cancels her concert in Israel, following appeals from Argentine and Uruguayan groups as well as Ahed Tamimi’s father and Palestinian and Israeli women’s groups. Six artists withdraw from the Israeli embassy-sponsored Pop-Kultur music festival in Berlin. World renowned musician Brian Eno condemns this collaboration in a video interview. The UK band Shopping, singer-songwriter Richard Dawson, Welsh musician Gwenno and American artist John Maus were the first to to withdraw from this year's festival. Two progressive Jewish groups in Germany also said they would boycott Pop-Kultur as long as it crosses the BDS picket line. Prominent cultural figures including Massive Attack, Angela Davis, Patti Smith, Danny Glover, Viggo Mortensen, Peter Gabriel and Tunde Adebimpe condemn Ruhrtriennale arts festival in Germany for initially dropping the band Young Fathers over its support for Palestinian rights. They welcome the German festival's decision to re-invite the band and defend BDS as a lawful exercise of freedom of speech. Amnesty International calls for an arms embargo on Israel and releases this powerful video to promote its call. It slams the United States and the European Union for their military deals with Israel and holds them responsible for “fueling mass violations" of Palestinian human rights. Human Rights Watch documents Israel's war crimes against Palestinians in Gaza and says officials responsible should be held accountable. The group calls for “sanctions against officials implicated in ongoing serious human rights violations.” An earlier report by HRW exposes how Israeli banks bankroll and profit from illegal settlements. Black cultural figures in the United States, including Jesse Williams, Rosario Dawson, Tom Morello, Michelle Alexander, Danny Glover, Vic Mensa, Angela Davis and Talib Kweli, endorse a Dream Defenders letter that calls on all US representatives to sign H.R. 4391. The bill, which would prevent US tax dollars from supporting the Israeli military's ongoing detention and abuse of Palestinian children, has 22 co-sponsors and counting. French car rental giant Europcar shuts down rental facilities run by its Israeli franchisee in illegal Israeli settlements built on stolen Palestinian land. It follows a growing number of companies that have divested from Israel's military occupation. Hewlett Packard (HP) companies face $120 million in potential losses in India due to their complicity in Israel’s violations of Palestinian human rights. This comes after India’s largest, four million-strong student association, joins the BDS movement and pledges to boycott HP companies over their well-documented complicity in Israel’s grave violations of Palestinian human rights. Roberts made clear that he wouldn't have agreed to participate in the first place if he'd known that the race was initially set to take place in an illegal Israeli settlement in occupied Palestinian territory. Also in New York, more than 50 New York University (NYU) student groups endorse the BDS movement for Palestinian human rights. 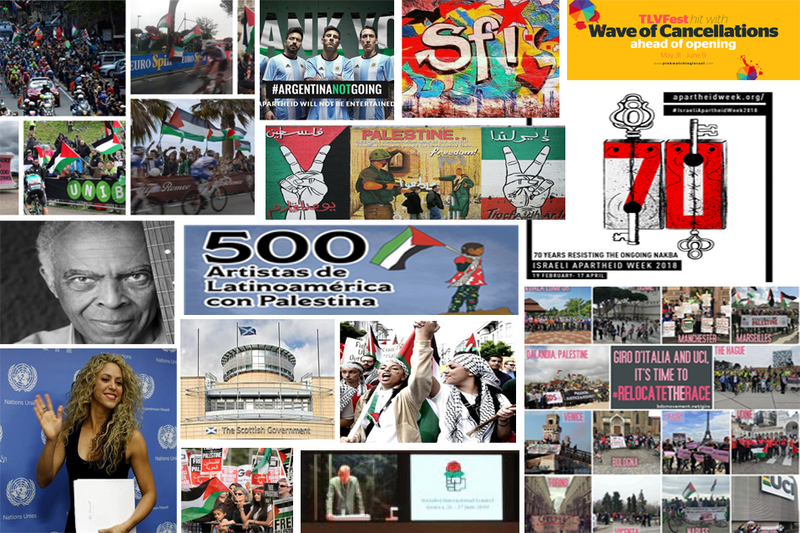 The student government of California State University - East Bay votes unanimously in favor of a resolution calling the university to divest from corporations that profit from the illegal military occupation of Palestine. At the University of Chile, 90% of the Philosophy and Humanities Faculty students vote to support the academic boycott of Israeli institutions and universities. Students also occupy the University's main building to protest the ongoing Palestinian Nakba and Israel's recent massacre in Gaza. The Union of Students in Ireland (USI), the umbrella body for student unions, votes to endorse BDS, following National University of Ireland Galway (NUIG), Galway-Mayo Institute of Technology (GMIT), Queen's University Belfast (QUB) and Trinity College Dublin (TCD) student unions.